The PHS Visual Art Department offers a range of classes to students of all levels who are interested in pursuing art for fun as a hobby or who have designs on becoming a professional artist. There are many career opportunities that involve art, knowledge of art and an advanced development of visual literacy. All of these are taught in our visual art program. The 21st century is a visually intensive age and the art program teaches students the skills needed to navigate art and media. ​One semester Intro to Art course is the prerequisite for all other art classes. The Animation/Experimental Video features projects that teach students many skills, students can take this course twice; once as Animation and once as Experimental Video. The revision of the Art History course now includes a travel experience to Chicago, Minneapolis or New York City in the semester long Art History course. AP Art History offers students a year-long intensive study of art which may culminate in a travel abroad opportunity. Offered for the first time in Summer 2016, this experience features 7-10 days of travel in a European Country (Italy, France or Spain are a few possibilities) with an emphasis of exploring art, architecture and the culture of the featured country. In 2016 we visited Italy, with stops in Florence, Venice, Rome, Pompeii and Assisi. 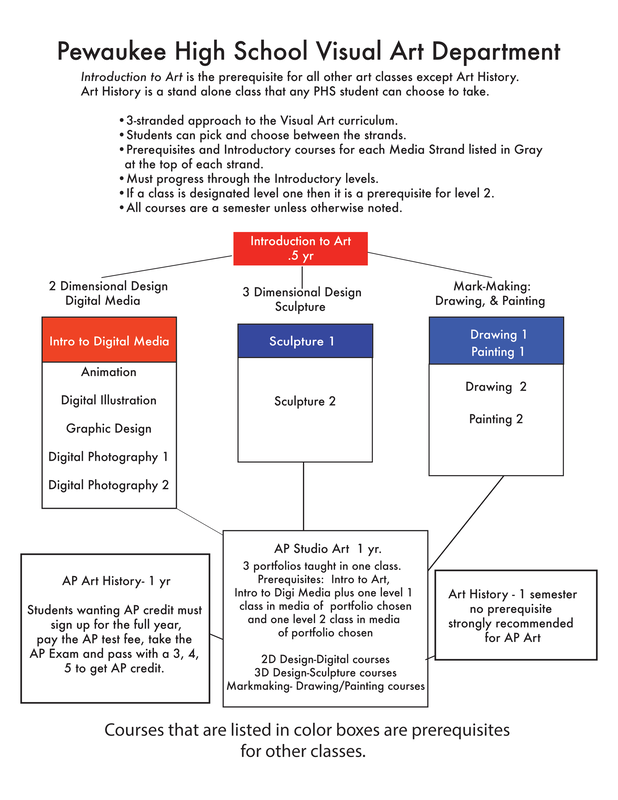 AP Studio Art offers students 3 portfolio choices and is for students who are mature and serious about their art studies. This is the perfect class for students considering college majors in art-related fields or careers. The course is a year-long class. To View a Detailed Scope and Sequence Chart Click here.